I may have a new favorite snood! This is the perfect snood for someone who has darker hair and who loves the classic beauty of lace, but who's wants something subtle (at least that was what I kept thinking when I was sewing!). I love lace at the moment! And hopefully I'll be able to come up with something with a bit more substance later tonight. My mind lately has gone in a circle of eat, sleep, play with the girls, sew. This is vergine on blogging-block! 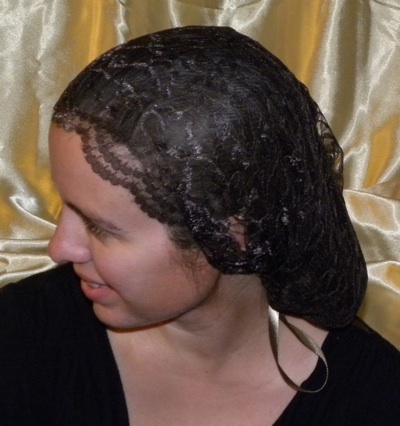 Now that looks like a wonderful thing for wearing to Mass for people who want something more subtle than a mantilla or who have little ones who might yank a mantilla off their heads. Now if you had it in a slightly graying shade of brown that matched my slightly graying hair, I might just have to order one. I like it. Kind of looks like one of my veils.